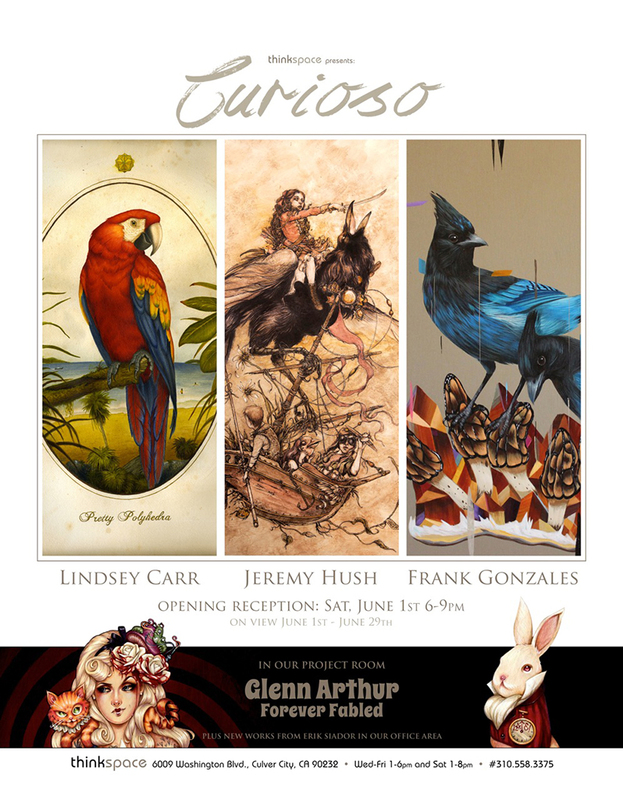 Thinkspace is pleased to present Curioso a group exhibition featuring new work by gallery artists Jeremy Hush, Lindsey Carr, and Frank Gonzales. These artists’ respective, and unmistakably distinct, practices explore contemporary representations of the natural and animal worlds. Their imagery is derived uniquely, relying on a combination of observation, historical 19th century natural history and botanical references, and their personal experiences of nature drawn in sharp relief against their immersion in the urban. Each artist taps into the unwavering hold of the natural world on the creative imagination, and distills a contemporary voice from a wealth of observed and appropriated traditions. Nature has long entranced the human as an anthropomorphic vehicle in visual art, an extended metaphor for the intrinsic animality of the human, and a subject of taxonomical conquest. Each artist revitalizes our visual interest in nature with a contemporary valence, while tapping into the unerring enjoyment of their representational traditions. Lindsey Carr’s beautifully executed animal portraiture of birds and primates takes the 19th century conventions of natural history printmaking and painting, from the likes of Audubon and Redoute, and transforms them into distinctly contemporary revisitations of this meticulous representational tradition. At times dark, and at others whimsical, her work incorporates text and unlikely juxtapositions with wit and humor. Her palette and execution recall antiquated relics, or illuminated manuscripts, invoking the past and confusing the contemporaneity of the work visually. Her appropriation of this natural history tradition engages the historical conventions of taxonomy and categorization with a contemporary appreciation of their uncanniness. Her work examines the proximity of the animal to the human, and intuitively explores the indelible hold of that link. Frank Gonzales‘ paintings of birds and flora are highly detailed and exceptionally rendered. As an artist having lived in Brooklyn for many years, his fascination with the natural world has inspired dedicated and meticulous representations. As a powerful counterpart to the urban, the natural world returns us all to something elemental and redemptive in the midst of the city’s machinations. Gonzales taps into this fundamental pull that nature exercises over the imaginary, and paints with true love of execution and process. His use of color and line, and his compositional inclusion of abstract elements and pattern, make his work distinctly contemporary and entirely his own. Jeremy Hush’s work is unmistakably his own in its combination of the lyrical and the chaotic; the organized and the spontaneous. Loosely influenced stylistically by historical 19th century print making, his work combines historical suggestion with a highly stylized contemporary aesthetic. Working primarily with ball point pen and unlikely found materials for pigment, Hush’s imaginary landscapes are haunted and beautiful, eerie and transporting. His works on paper are highly dense and lush, containing layer upon layer of symbolic iteration and elaborately elusive narrative. His use of natural imagery recalls the visual conventions of fable, allegory, and dream.